Friday June 6th 1902 Will went down town this morning. he got a new chair and screen door. he jist escaped a heavy rain. Fred went down to the show in the afternoon but there was another terrible rain. Will put up a couple of screen doors and I was kept very busy with my chickens. Saturday June 7th 1902 We churned again. I was busy with the work. We went to town in the afternoon. I did not get to see Mollie Briggs who came Thursday evening. weather cooler. Sunday June 8th 1902 I went to town with [Shradrs?] [Walter?] this morning and stopped at home awhile and at Woolfs. I got Will and I some dinner and read and wrote in the afternoon. Ida & Bernie were here. I wrote Laura Mason in regard to coming to summer school here. 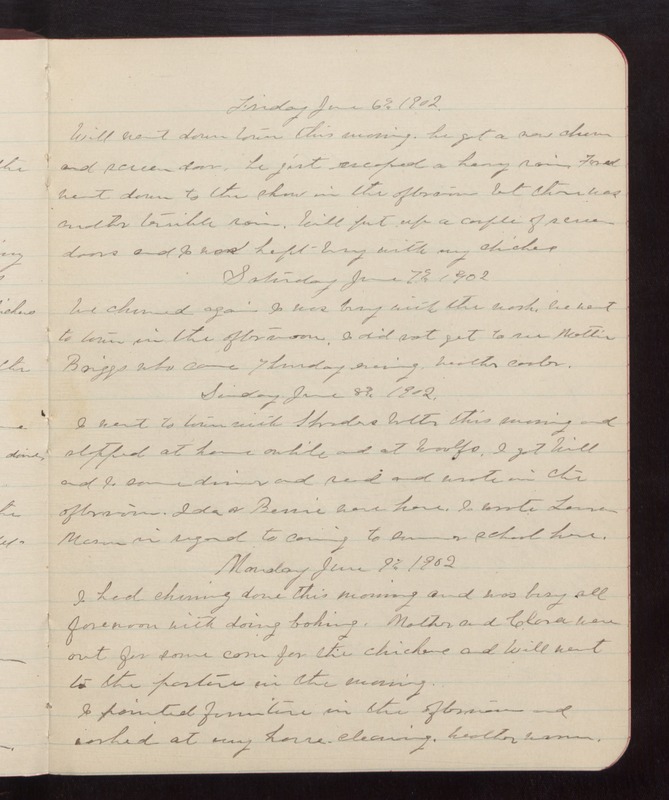 Monday June 9th 1902 I had churning done this morning and was busy all forenoon with doing baking. Mother and Clara were out for some corn for the chickens and Will went to the pasture in the morning. I painted furniture in the afternoon and worked at my house cleaning. weather warm.